Since the very beginning of SOLAR- COMPUTER the modular structure is one of our core competencies. We do not offer applications in isolation as we are convinced that an intelligent interface to combine the applications is crucial. 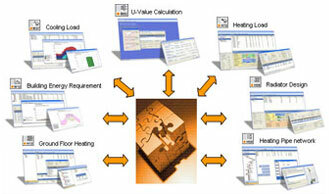 This software package includes all calculation software to calculate heating installation. In addition we offer GBIS as an option, which is our intelligent connection with AutoCAD MEP 2010. This package includes all software modules to calculate cooling load. In addition we offer GBIS as an option, which is our intelligent connection with AutoCAD MEP 2010. We are looking for experienced customers in the UK market to continuously improve our products.